Districts, educators, and researchers from around the country gathered in Austin, Texas this past October to share best practices and current thinking at the Annual Conference of the National Dropout Prevention Conference. The conference was the nation’s largest convening of education leaders and dropout prevention practitioners on the topic of improving K-12 graduation rates in recent years. Over 800 participants from 48 states attended the conference. Participants included state superintendents, district superintendents, state department of education officials, principals, counselors, and teachers. 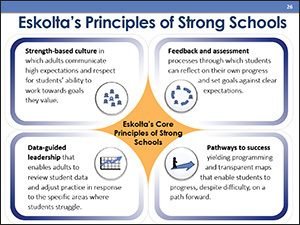 Tom McKenna from Eskolta presented a session on “The 4 Elements of a Successful Transfer School: Stories from NYC.” The presentation, attended by practitioners from 14 different states, highlighted the work of Eskolta, the NYCDOE, and our partner schools over the past 5 years in New York City in working with formerly disengaged students.